After a few busy weekends, I was finally able to get out and do some serious birding. I decided to head down south to Santa Cruz County. 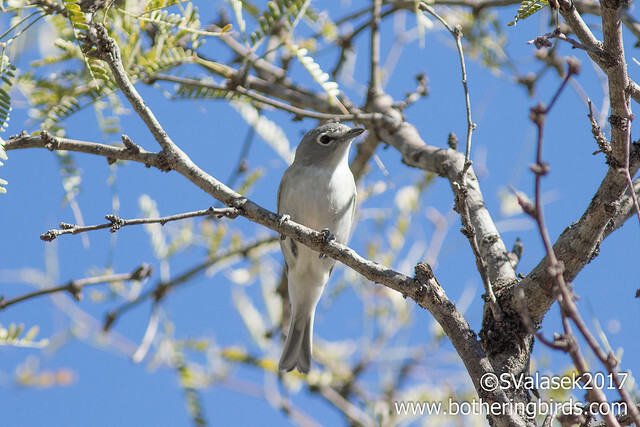 There had been some noteable birds seen in the area, namely some Rose-Throated Becards. In addition there had been a very reliable, but rare for Arizona, Brown Thrasher in the area and also some Ruddy Ground Doves too, all would be lifers for me. After I had ticked all of those and had lunch (hahahahahah) I didn't know if I'd head to Paton's for a Violet-Crowned Hummingbird, trying for the Nutting'f Flycatcher or maybe cruise through the Santa Cruz Flats for Ruddy Ground Doves and Mountain Plovers... at least that was the plan. 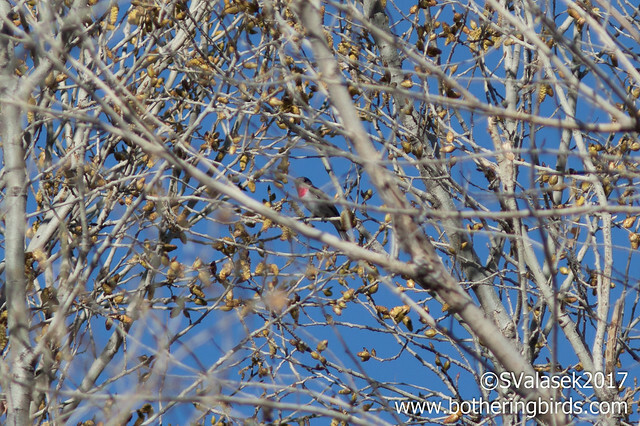 My focus was the Rose-Throated Becard since it was least common bird in the area. The listserv reports had dried up, but that didn't mean that the bird had moved on. Checking eBird I decided to start at the northern range of sightings in Tubac at Ron Morriss Park and the Tubac Bridge. 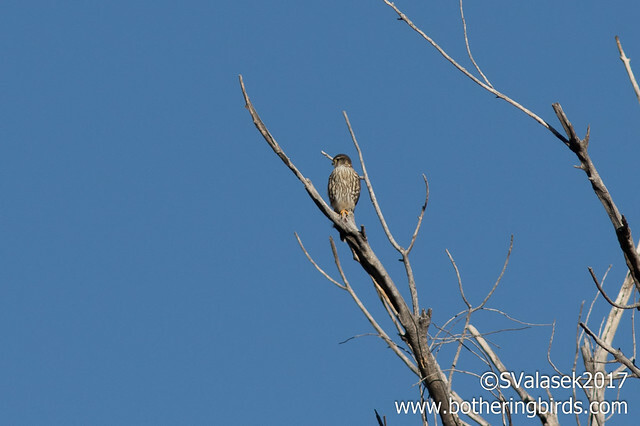 An Accipiter that flew by me and into the woods was the first bird that I saw while looking for access to the trail. I could see the trail, but it was behind a fence and a locked gate. 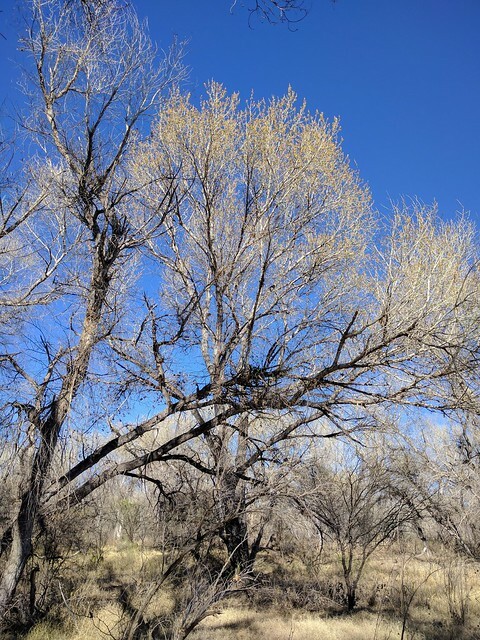 A quick hike north to Tubac Bridge Road put me in the right place to access the trail and to see a Merlin perched in a tree. I followed the trail down south along the river and past my car. 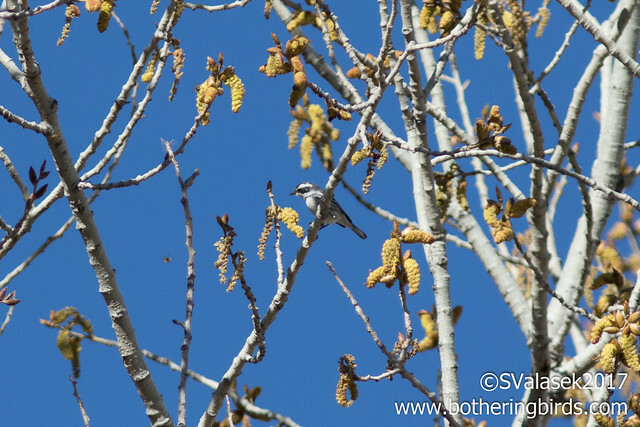 There were some Bridled Titmice about and the always present Gila Woodpeckers, but nothing that I saw in the Flycatcher family. The Sun was in my face too, so my plan was to head south quickly, and then return north with the Sun to my back. I did stop to see a low Plumbeous Vireo that was foraging near some nice-looking houses. I made it a habit of asking anyone with binoculars about the Becard with no news. One of the people that I met was a friend of a friend that I had talked to the day before. While walking along I saw a hawk fly down along the water and land on a tree east of me. It was all dark with a uniform dark back and a dark tail with a white band across the end of the tail. 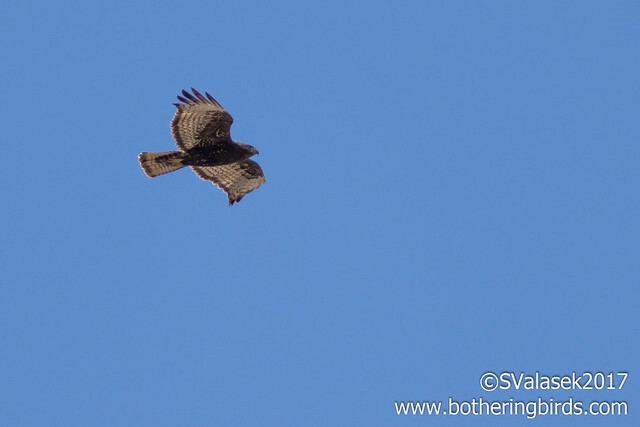 The only bird that would fit with the area and that appearance is a Common Black-Hawk. I don't think that a Zone-Tailed Hawk would be in that habitat. It is rare for them to be there in the winter though. Before I had a chance to get a photo it was scared off by some passing dog-walkers. I did get to see a Harlan's Red-Tailed Hawk,which is uncommon for Arizona. I finally reached the part of the trail that disappeared into the flooded river. I saw some Sparrows, but nothing close to being the Becard, so I turned around and walked back to my car. I decided to pass through Ron Morriss Park proper to save some time and was rewarded by a large, mixed-flock of Sparrows. Some White-Crowned, Chipping, Vesper and even some Lark Sparrows were all feeding under some pine trees. 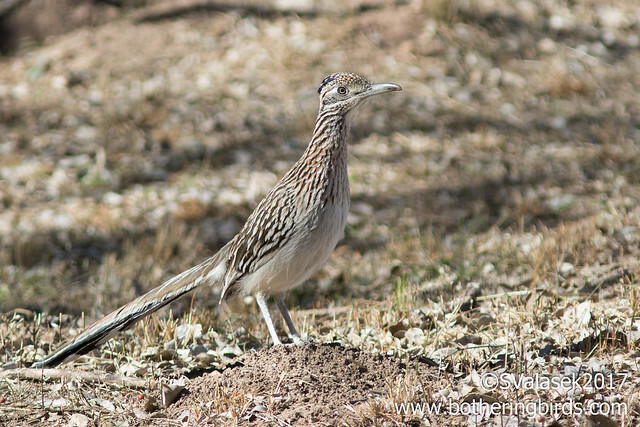 A Greater Roadrunner and hunting Say's Phoebe were also nearby. 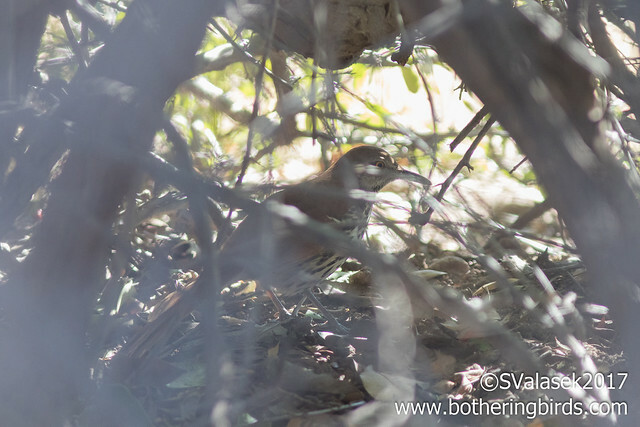 At this point I decided to drive a bit further south to Santa Gertrudis Lane where a Brown Thrasher had been reliably seen for most of the winter. It's an odd private road that only allows foot traffic in. It was just a quick walk down to the right spot, so I decided to leave my pack and water behind and just take my binoculars and camera. I noticed a birder already down there and it wasn't a far walk. Once I reached the area I realized that the birder was an English lady who I had met in October. She was on her way from Seattle to Green Valley for the winter and needed a place to stretch her legs. She randomly stopped at Hassayampa River Preserve after seeing the binoculars sign on the highway. We talked a bit then and nearly missed an American Bittern. She mentioned that the Thrasher had yet to make an appearance and that she had dipped on it once before. It was a busy location with a bush full of red berries. A robin flew in at one point and we got excited that it may have been a Rufous-Backed Robin, but it was just an American Robin, still nice to see in Arizona. 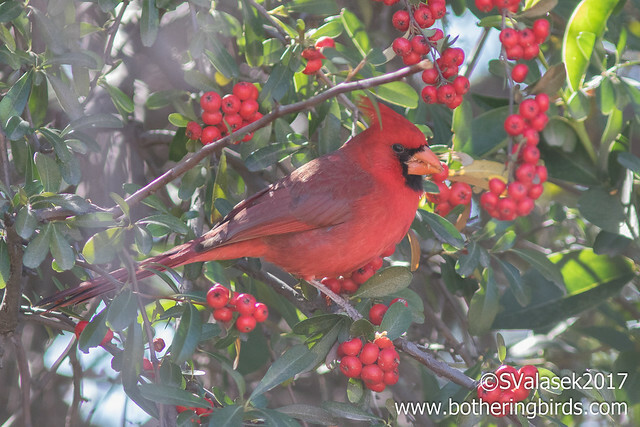 There was also male and female Northern Cardinals eating the berries in front of us. We were waiting nearly 20 minutes before the Brown Thrasher made an appearance. It seemed to come out of nowhere and stuck to the thick bushes and shadows while it foraged. Satisfied with my looks and a few blurry shots, I decided to walk a bit on the De Anza Trail which was very nearby. I said cheers to my friend from Seattle and went on my way. I ran into a birder who had just seen a female Rose-Throated Becard a quarter mile back up the trail. I told her where to look for the thrasher and hurried on my way. 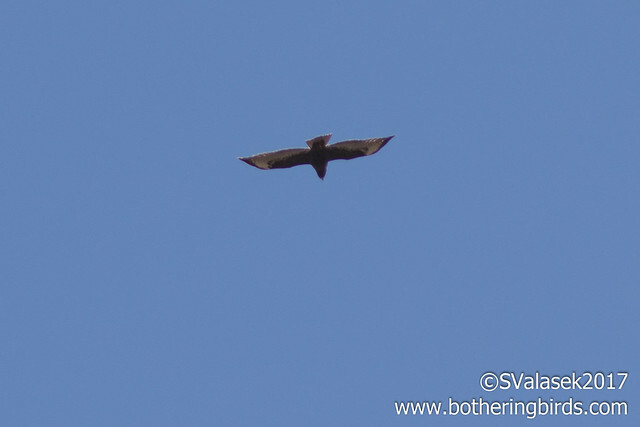 A short way later I noticed another hawk flying over, this was another dark one and fairly low. It was another Harlan's Hawk, but different than the first one. This one had a dark border on the end of the tail and wings which the other did not. It was mad to see two uncommon hawks in the same area. But I continued on my quest. I knew from guides that the Becard preferred the tops of tall trees near water and there was plenty of that around. But the trail at this section was covered with some shorter trees and made looking at the tops of the taller trees difficult. So I made my way into a clearing and looked around for movement. There were loads of Ruby-Crowned Kinglets and sparrows lower down, but not what I was looking for. And then a shape went flying about me head-height to my left and I had to make a double-take. It was a Great Horned Owl cruising by in the middle of the afternoon, weird. I continued scanning hoping to see something. I walked around a bit, but it all looked the same to me. I was on my way back north to the main trail when I did one last scan. 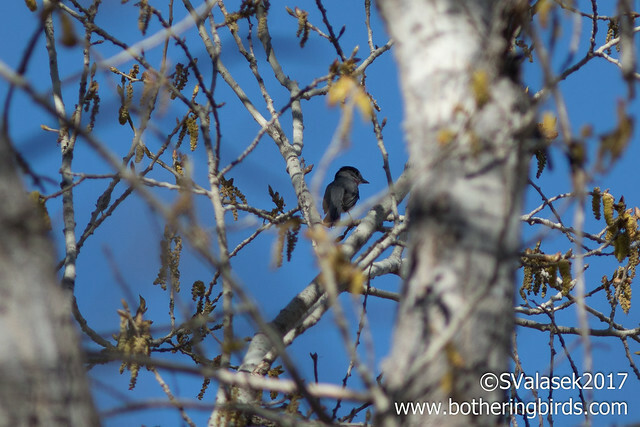 That's when I noticed some activity in the top of a tree filled with forming buds. I noticed a Yellow-Rumped Warbler, and then a Black-Throated Gray Warbler. 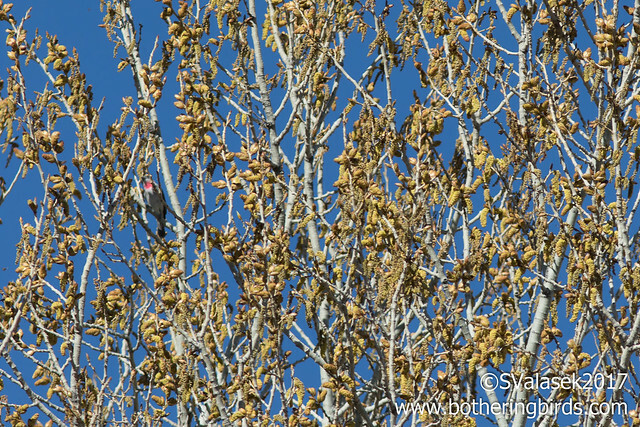 There were still more birds up there, some more Kinglets, and Orange-Crowned Warbler and then I saw it. A patch of pink among the yellow (flowers?) at the very top of the tree. Can you see it? That's a cropped photo from the top of a tall tree about 75 feet or so in front of me. Tree the Becard was in. I'm still not sure how I spotted it, but I let out a "whoot!" when I did. The bird never stood still for very long and never in a spot on the side of the tree near me. I watched it for a long while getting infrequent looks. By this point I was really thirsty, it had been a couple of hours since I left the car and water behind. I finally gave in and turned to go. I made it a few hundred yards down the trail when I recognized a familiar face scanning the treetops. I said hi and asked if he was looking for the Becard, he said "yeah" and I said "follow me". He was with a guide from the area and two clients. I took them back up the trail and found the side-path to the clearing. All this time I had my fingers crossed that it was still there, and it was. Everyone managed to get some good looks for another half an hour or so, even when it finally changed trees. There's a feeling that you get when you work really hard to see a bird and I certainly had it, as tired and as thirsty as I was, and that's probably why do it. All in all, a great day. I also learned that Becard is pronounced like "Beck-hard" and not "Be-card". I'm sorry, I have no idea what kind of tree that was or what those yellow things are called, if you know, please let me know in a comment. Here's my eBird checklist. You can see where I saw the Becard, which was near the Tumacacori section of the De Anza Trail, and more information on that can be found here. Nice work Steve! Impressive perseverance and camelness. That's such an cool area, hot but leisurely for great birding, and it doesn't even have the Gray Hawks back yet!